Most likely inspired by Lin-Manuel Miranda's musical Hamilton storming onto Broadway, it seems like there have been a ton of Alexander Hamilton-related books published in the last couple years. Even better, some of those have focused on his wife, Eliza Schuyler Hamilton (because we all know that too often the stories of women get overlooked). 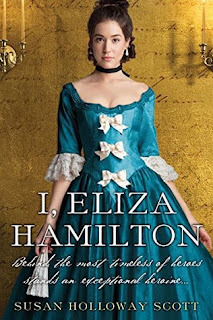 I have three Hamilton books on my TBR, so I thought it would be fun to review a couple of them together (and for a really great review of yet another one, see Stephanie at Bookfever's review of My Dear Hamilton). It's interesting how different authors can take the same characters and basic history and make it seem completely different. I'll be honest, though - even though I love history, American history has never really been my strong suit, so I can't really speak fully to the historical accuracy of these books. 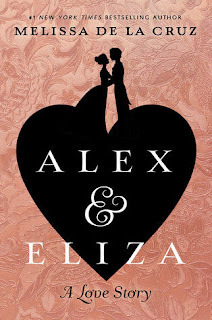 The first in a series, Alex & Eliza takes a look at the pair's inauspicious first meeting and journey up to the time they marry. Eliza came across as a very practical, intelligent woman. She really wanted to help the war effort, and she didn't like the idea of wearing fancy dresses or going to balls when soldiers were freezing and starving. Even though he's a master of words, Alexander Hamilton was often (kind of adorably) flustered when he was around Eliza. I liked seeing their relationship from both points of view, and especially how Eliza came around on Alexander after initially not liking him. Eliza's family is very prominent, but Hamilton comes from practically nothing. He knows on paper they wouldn't be a good match, and he's determined to better himself, just for her. Speaking of Eliza's family, her sisters were forces to be reckoned with. They were very fun side characters, and I liked watching both of them take control of their own lives. Eliza recounts her life with Alexander Hamilton, detailing their courtship and marriage, ending with his untimely death. Although I enjoyed this book, I can't say I loved it. The writing was good and very much evoked the time period, but it also felt dense and even dry at times. Some parts felt like reading a textbook about the American Revolution and aftermath, so if you're really interested in learning all those little details, you'll appreciate this book. Great reviews! I felt the same way about Alex and Eliza. I have book two, but I am not sure I will have time to read it. I passed it on to my cousin who is obsessed with Hamilton. Have you read My Dear Hamilton yet? I thought that was pretty good. That's the other one that's on my TBR, and hopefully I'll get to it someday! I've heard SO many good things about Alex and Eliza, but haven't gotten around to reading it. I'm not sure when I'll next be in the mood for historical fluff, but I'll definitely add it to my TBR! It was a cute read - I mean, I don't know how accurate it really was, but it was fun fluff! Iso want to see Hamilton -- it sounds amazing, and would help me appreciate books like this too. Yeah, I wish I had a little more knowledge going in these books! These books hadn't really been on my radar prior to seeing Hamilton while I was in New York, but I have to admit I've been eyeing Alex & Eliza ever since I got home now that I have Hamilton fever, lol. It sounds like a fun spin on their relationship. It's a very light take and a quick read! These sound so interesting, I know almost nothing about Hamilton or Eliza haha. I've read a short story by Melissa de la Cruz but that's it. I'd like to read more. I've read a couple of her books now; they're very light and fun! Alex & Eliza sounds like a quick fluffy read and I'm glad you ended up enjoying it for the most part. I have a thing for couples who might not get along right away. Might have to check it out sometime in the future. Thanks for sharing your thoughts. Thank you for stopping by, Alicia! I mean, I would probably never see the Broadway show (and the cost of the tickets is only one reason! ), but it's an area of history that interests me and I want to know more about. Nonfiction November 2018: New To My TBR! Nonfiction November 2018: Let's Eat!